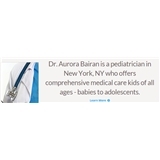 Aurora C. Bairan, MD. (New York) - Book Appointment Online! Dr. Aurora C. Bairan graduated from the University of the Philippines College of Medicine, Manila, Phillipines in 1967. She works in New York, NY and specializes in Pediatrics and Dermatology. Dr. Bairan is affiliated with Mount Sinai Beth Israel and NYU Langone Medical Center. Dr. Bairan was very sweet and comforted me during my visit as she confirmed a condition that I believed I have. I look forward to seeing her at the follow up.